The past 20 years have given rise to the proliferation of “satellite” infrastructure across the world. Mobile communications across the less-developed world have bypassed traditional “wired” infrastructure in exchange for cell phones. In the energy sector, China, the U.S. and Europe continue to lead the way in installing and operating distributed solar panels and wind farms as alternative, renewable energy supplies. And over the past several years, the wastewater treatment and reuse industry has caught the distributed bug. Humans have reused wastewater — primarily out of necessity — since the beginning of time. As the adage goes, “All water is reuse water.” Today, drought’s chokehold has once again gripped several regions throughout the United States — from the typical witnesses in Southern California to Midwestern farmers to industry in the Southeastern United States. As a result, many municipalities and industries alike have begun to look toward distributed wastewater treatment and reuse as both a sustainable and economically productive means of offsetting traditional potable water supplies. But the policies regulating these new systems — requirements surrounding manufacturing quality, effluent constituents and monitoring frequency — remain scattered and inconsistent, often conflicting between overlapping jurisdictions such as local, city and state governments. Despite these extant inconsistencies, the world continues to move toward greater numbers of these types of installations. As this growth curve continues to accelerate, it becomes more important for individuals and companies across the wastewater value chain to develop a greater understanding of the policies that regulate their behavior. Specifically, it is important that not only the wastewater treatment technology providers but also the MEPs, architects and property owners clearly understand the regulations that serve to guide the industry for the next generation of wastewater infrastructure installations. In this article, we’ll explore various policies’ impact on various stakeholders in the installation and operational value chain and determine key missing components necessary for more seamless integration of distributed wastewater into the future. The State of California Water Resources Control Board, Division of Drinking Water Program, formerly known as the California Department of Public Health, adopted Title-22, Division 4, Chapter 3 (commonly known as “Title 22”) to deal with water recycling criteria across the state. Over the past decade, Title 22 became the veritable standard for wastewater reuse not only in California but across the country. Title 22 standards are focused on minimizing the risk of health-based impacts on human populations through wastewater recycling via treatment of bacteria, protozoa and viruses. Also, by tracking various effluent parameters such as biological oxygen demand, pH, total suspended solids and ammonia, among other parameters, California manages acceptable effluent quality from satellite treatment plants across various end-use such as irrigation, toilet flushing and cooling tower makeup water. One of, if not the primary, reason behind Title 22 was to establish a set of minimum parameters through which municipalities, industry and the public could utilize existing, nonpotable sources for nonpotable use, whether the treatment would occur at a centralized treatment plant or a satellite facility. Today, the standard drives the distributed wastewater reuse market across the country as technology companies routinely seek Title 22 approval in California before moving to market throughout the rest of the country. Title 22, then, does allow for novelty and innovation in the broader wastewater reuse market, pending confirmation that such new technologies provide the same established levels of effluent quality and protection for human health. In essence, Title 22 was and is the standard bearer for wastewater reuse regulations in the U.S. The effective and safe roll-out of this standard has led, in part, to the proliferation of other wastewater policies across various cities, states and regions in the U.S.
Where Title 22 has become the foundational policy surrounding nonpotable wastewater reuse on the state level, San Francisco Article 12C has emerged as the bellwether of city-scale mandates requiring nonpotable treatment systems for nonpotable use in new real estate developments. As of late 2015, Article 12C became a mandatory requirement for new development projects over 250,000 square feet of gross square footage — requiring the installation and continuous operation of onsite nonpotable water systems. This standard, in many ways similar to Title 22, utilizes a health-based qualification for implementation of cost-effective and technologically appropriate greywater and blackwater treatment systems. For many, San Francisco Article 12C was a welcome and long-overdue development, leading to the use of different “flavors” of water for various activities (potable water for drinking and showering, nonpotable water for toilet flushing and irrigation). Replacing the demand for toilet and urinal flushing with nonpotable water is estimated to offset approximately 25 percent of the total potable water use in any residential building, and up to 75 percent in a commercial building. Article 12C differed from many wastewater reuse regulations that came before it by using a new, innovative, health-based standard rather than one focused on relative risk. 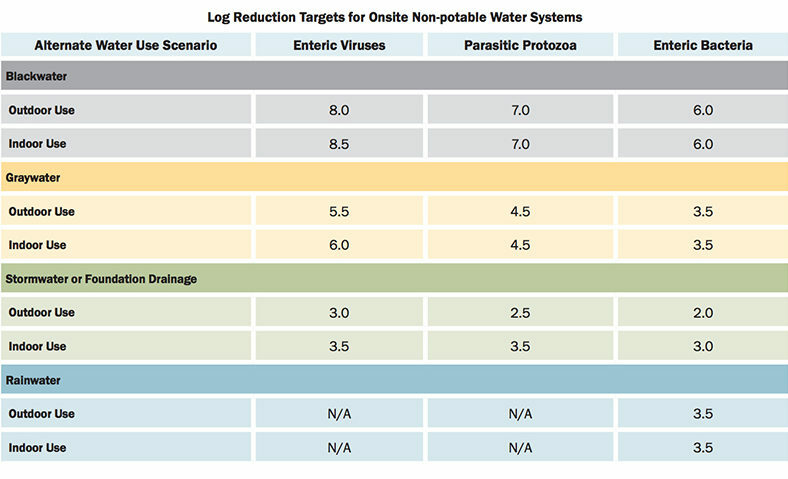 Through collaboration with the San Francisco Department of Public Health and the San Francisco Department of Building Inspection, the San Francisco Public Utilities Commission developed a chart that serves as the barometer of successfully treating incoming wastewater for onsite, nonpotable purposes. Note that 1-Log reduction refers to the removal of 90 percent of a constituent, 2-Log reduction to refers to 99 percent removal, 3-Log reduction refers to 99.9 percent reduction, etc. Submit a water budget application to the Public Utilities Commission. Submit a nonpotable implementation plan to the SFPUC. Submit engineering report, permit application and application fee to the Department of Public Health. Obtain plumbing plan check and permits from the Department of Building Inspection and complete system construction. Obtain encroachment permit from the San Francisco Public Works Department. Obtain a permit to operate from the Environmental Health Department. Conduct ongoing monitoring, reporting and inspections. Today, SFPUC continues to work with various industry stakeholders to implement and improve Article 12C. As new buildings begin to implement these systems, though, many questions remain. Specifically, how can one ensure that these systems will operate efficiently and properly in new buildings with no influent quality history? How can technology suppliers best work with local MEPs to coordinate technology implementation and operation for the many years during which a treatment system will operate? How will regulations change in the future and what will that do to the existing infrastructure? The answer to these questions, among others, will determine the success of wastewater reuse policy in San Francisco and, in turn, similar policies being implemented across the U.S. in light of San Francisco’s efforts. While Title 22 and San Francisco Article 12C continue to drive the distributed wastewater reuse market in California, other policies and mandates have begun to pop up in other states around the country. NSF 350, a set of standards developed by NSF International — an independent, not-for-profit, nongovernmental organization — is one standard that has provided significant support in the development of onsite wastewater reuse standards from Los Angeles to Colorado’s Graywater Control Regulation to the Chesapeake Bay. In addition to providing a blueprint for cities developing new on-site wastewater reuse standards, NSF 350-approved treatment systems satisfy requirements for LEED Homes’ Water Efficiency credit as well as the National Association of Home Builders’ National Green Building Certification Program. 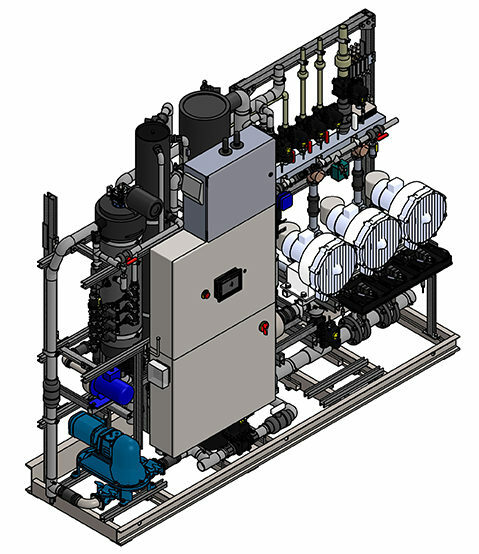 The goal of this standard is to “establish minimum material, design and construction, and performance requirements for onsite residential and commercial water reuse treatment systems,” as well as minimum documentation and service-related requirements. In comparison to Article 12C as a health-based standard, NSF 350 was designed as a risk-based standard to protect human health similar in methodology to that of the U.S. EPA. NSF 350 standards, entangled in a bulky packet of definitions, methodologies and processes, can ultimately be broken down into three distinct buckets: documentation, design and testing/monitoring. Documentation requirements specify that all manufacturers provide an owner’s manual, an installation manual, and an operations and maintenance manual. As part of its risk-based focus, the standard provides a detailed account of the requisite quality of systems designed for onsite wastewater treatment. Specifically, manufacturers desiring to build systems in accordance with NSF 350 must pay particular attention to the structural integrity of materials, welding, water tightness, noise and various mechanical and electrical components placed upon the skid. Many of these standards, while important for each project, can be managed through the careful selection of a qualified, experienced manufacturer and fabrication shop. Lastly, and perhaps most importantly, NSF 350 details a comprehensive testing and monitoring campaign to ensure proper treatment of influent water into the system. An approximately six-month performance test is geared toward ensuring proper system function during startup and non-steady state operations (e.g., vacation stress times). It ends with an ongoing sampling campaign of both influent and effluent waters for well-established constituents such as BOD, COD, TSS, turbidity, E.coli, pH, color, odor, temperature, TKN, P, and others. NSF established a testing platform through which manufacturers (and owners) can be sure of proper treatment quality. To date, only three onsite wastewater reuse manufacturers have ponied up the significant fee to achieve pre-certification with NSF — most, including my own, instead focus on guaranteeing and monitoring desired effluent quality across various geographies. Similarly, Article 12C, Title 22 and NSF 350 will all work, but cities and states continue to decide what standard will work best for its residents. Regardless of the successes that these standards have thus far enjoyed, the goal should still be to create a single, standardized platform through which industry (and the public) can better understand the requirements imposed on them, as well as the potential risks of any onsite wastewater reuse system. 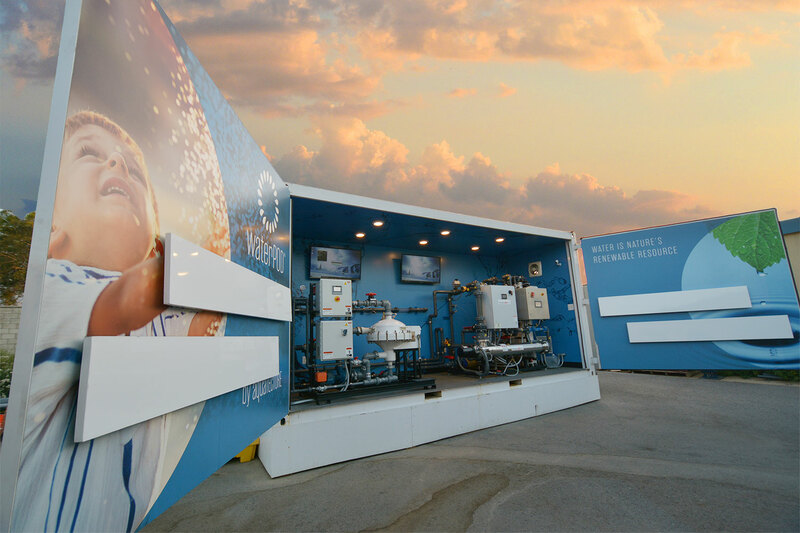 While the world of onsite wastewater reuse seems new and potentially intimidating, the long-term benefits of the implementation of these types of systems are sure to make current uncertainties worthwhile in the long run.